Ben has been a youth soccer referee for 44 years, but the past few years have seen the biggest downturn in sportsmanship, respect for referees, and general attitude amongst players, coaches, and parents. The Washington Post ran an article last year claiming that referee abuse has caused a shortage in youth referees, and unfortunately it’s often the parents who are the worst perpetrators. Instead of complaining about it, Ben decided to take action. Last year we partnered with schools to hang up banners at sports fields that encourage parents to set a good example, and Ben started carrying around special yellow cards to “card” parents who are acting out of line at his games. This year, however, we’ve taken it a step further with the biggest campaign yet to fight back against referee abuse. 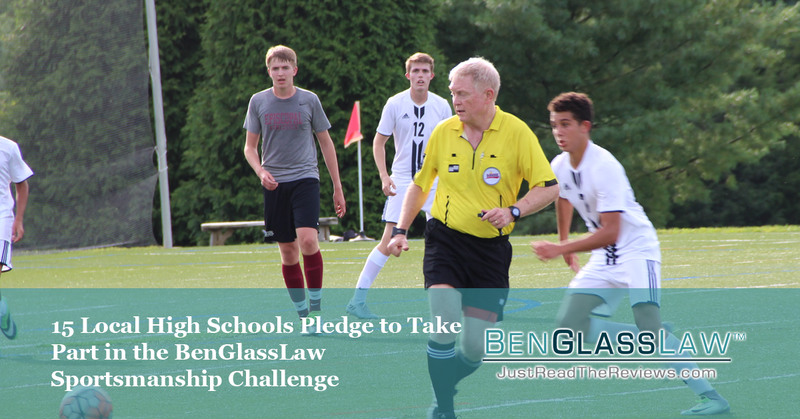 The BenGlassLaw Varsity Soccer Sportsmanship Challenge offers teams a chance to win $500 for both the boys team and the girls team (potentially $1000 per school) if they can make it the whole season without any yellow cards or red cards for unsportsmanlike conduct like dissent or profanity. Originally, we invited 11 schools to the program. We sent 100 mailed packages to decision makers and influencers at schools, referee organizations, sports leagues, and media to make them aware of the problem and our solution. The response was so positive and so overwhelming that Ben generously decided to let in an additional 4 schools off of the waiting list, with the hope that next year we can expand the program even further. Here are the schools which have been accepted to the program for one or both of their teams: Fairfax, South County, Thomas Jefferson, Fauquier, Robinson, JEB Stuart (to be renamed Justice High School next year), Garfield, Robert E. Lee, Woodson, West Springfield, Westfield, Lake Braddock, Centreville, Oakton, and Chantilly. Congratulations to the schools that have been accepted, and we’re EAGER to write a lot of checks at the end of the season to schools that can make it all the way without unsportsmanlike behavior. There’s a wonderful article in the Fairfax Connection about Ben’s efforts with the program, and we hope more will catch on. Referee abuse is not talked about enough in our community, and our goal is to make a measurable dent in unsportsmanlike conduct through Ben’s generous incentive. By the end of the year we will be able to tell if schools on the program received fewer cards than the rest of the league. If we can prove a measurable difference, we’ve made a real impact.